The process of filtration is used to separate insoluble solid component of a mixture from the soluble components in a given solvent. It is used to separate a mixture of naphthalene and urea using water as solvent. Urea dissolves in water while naphthalene remains insoluble. Upon filtration ,naphthalene remains on the filter paper while urea is recovered from the filtrate by evaporating water. For example: A mixture of anthracene and benzoic acid is separated by dissolving the mixture in hot water and filtering the hot solution. Benzoic acid dissolves in hot water but anthracene does not. Upon filtration, anthracene remains as a residue on the filter paper while benzoic acid crystallises from the filtrate on cooling. The filtration is very slow and takes a long time. In such cases, filtration is carried out under reduced pressure using a Buchner funnel and water suction pump. Crystals are the purest form of a substance having definite geometrical shapes. The process by which an impure compound is converted into its crystals is known as crystallisation. It is based on the difference in the solubilities of the compound and the impurities in a suitable solvent. The impure compound is dissolved in a suitable solvent in which it is sparingly soluble at room temperature but appreciably soluble at higher temperature. The solution is concentrated to get nearly a saturated solution. When this saturated solution is cooled, crystals of pure substance will separate out which are removed by filtration. The filtrate, i.e., mother liquor contains the impurities along with small quantity of the compound. If the compound is highly soluble in one solvent and too little soluble in another solvent, then crystallization can be carried out in a mixture of these solvents taken in a suitable ratio. (a) It should not react chemically with the impure substance. of the substance is thrown out upon cooling. (c) Either the impurities should not dissolve at all in the solvent, or if they dissolve, they should be soluble to such an extent that they remain in the solution, i.e., in the mother liquor upon crystallisation. The various solvents which are commonly employed for crystallisation are water, alcohol, chloroform, carbon tetrachloride, benzene, acetone, ethyl acetate, petroleum ether etc. 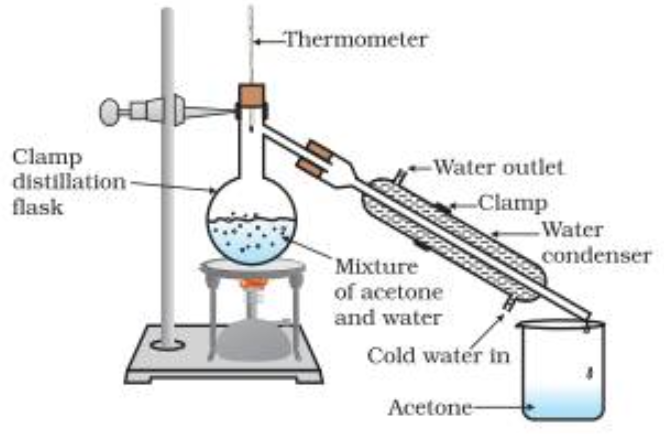 (2) Preparation of the solution. The impure substance is finely powdered and then heated in a conical flask with a small quantity of the solvent which is just sufficient to dissolve whole of the substance on boiling. (3) Filtration of the solution. The hot solution obtained above is then filtered immediate either through fluted filter paper or through hot water funnel to avoid crystallisation during filtration. (4) Crystallisation and separation of crystals. The dish containing the solution is then allowed to cool undisturbed when after some time crystals begin to separate out. If the crystals do not appear even after a long time, then it may be necessary to scratch the sides of the dish with a glass rod. This process of inducing crystallisation by adding a crystal of the pure substance into its saturated solution is called seeding. (v) Drying of crystals. The crystals are finally dried either in air or by placing them in a steam oven or an air oven. (vi) Removal of colour. Sometimes, the crystals obtained are slightly coloured due to the presence of certain coloured impurities.In such cases, crystals are redissolved in the same solvent and a small amount of activated charcoal is added to it. The mixture is boiled for 15-20 minutes. During this treatment, charcoal absorbs all the coloured impurities. The charcoal is then filtered out and the filtrate is allowed to cool when colourless crystals of the pure substance are obtained. Crystallisation of sugar. Suppose we have a sample of sugar containing an impurity of common salt (sodium chloride). This can be purified by shaking the impure solid with hot ethanol at 348 K. The sugar will dissolve whereas the common salt remains insoluble. The hot solution is filtered, concentrated and then allowed to cool when crystals of sugar will separate out. Crystallisation of benzoic acid. Suppose we have a mixture of benzoic acid and naphthalene mixture.This mixture can be purified by treating the impure solid with hot water. Benzoic acid will dissolve while naphthalene remains insoluble. The hot solution is filtered and then allowed to cool when crystals of benzoic acid separate out. .The crystals are separated by filtration and dried. This method is used to separate and purify two or more compounds which have different solubilities in the same solvent. The mixture is dissolved in a suitable solvent in which the two components of the mixture have different solubilities. When a hot saturated solution of this mixture is allowed to cool, the less soluble substance crystallises out first while the more soluble substance remains in the solution. The crystals are then separated from the mother liquor and is again concentrated and the hot solution again allowed to cool when the crystals of the second (i.e., more soluble) compound are obtained. The process of separation of different components of a mixture by repeated crystallisations is known as fractional crystallisation. It involves the direct conversion of a solid into the gaseous state on heating without passing through the intervening liquid state and vice versa on cooling. Only those substances whose vapour pressures become equal to the atmospheric pressure much before their respective melting points are capable of undergoing sublimation. Such substances are called sublimable. The process of sublimation is very useful in the purification of such solids which sublime on heating and are associated with non-volatile impurities. The impure substance is taken in a china dish covered with a perforated filter paper over which an inverted funnel is placed.The stem of the funnel is plugged with a little cotton.On heating the dish on a sand bath, vapours of the volatile solid rise up, pass through the holes in the filter paper and condense on the cooler walls of the funnel leaving behind the non-volatile impurities in the dish. Camphor, naphthalene, anthracene, benzoic acid, iodine, etc are purified by this process. Distillation involves conversion of a liquid into vapours by heating followed by condensation of the vapours thus produced by cooling. The method is commonly used for those liquids which are sufficiently stable at their boiling points and which contain non-volatile impurities. For example: simple organic liquids such as benzene, ethanol, acetone, chloroform, carbon tetrachloride, toluene, xylenes, etc. can be purified by simple distillation. (1) When the flask is heated, the temperature rises gradually and the liquid starts boiling when its vapour pressure becomes equal to the atmospheric pressure. These vapours as they pass through the condenser are condensed. Only the liquid which distils at a constant temperature is collected in a receiver. This gives us the pure liquid. Purification of a mixture of liquids. It can also be used be used for separation and purification of a mixture of two or more miscible organic liquids provided their boiling points differ by 30-50 K.
The separation is based upon the fact that at the b.p of the more volatile liquid (low boiling) of the mixture , the vapours almost exclusively consist of the more volatile liquids. At the boiling point of less volatile liquid , vapours almost entirely consist of the less volatile liquid since the more volatile liquid has already distilled over.The separation of the liquid mixture into individual components cab be achieved at their respective boiling point , the more volatile component distils over first while the less volatile component distils over afterwards. (3) mixture of benzene (b.p. 353 K) or chloroform (b.p. 334 K) and aniline (b.p. 457 K) and so on. If the b.p.’s of the two liquids of the mixture are very close to one another i.e. differ by 10 K or so, the separation cannot be achieved by the simple distillation method as described above. This is due reason that at the b.p. of the more volatile liquid of the mixture there will be sufficient vapours of the less volatile liquid as well. As a result, both the liquids of a mixture will distil together and the separation is denied. The separation of such a liquid mixture into individual components can, be achieved by fractional distillation, which involves repeated distillations and condensations. Fractional distillation is carried out using a fractionating column. lt usually consists of a long glass tube with a wide bore either packed with glass beads, small stones, porcelain rings or coke, or blown into a number of spherical or pear shaped bulbs. The actual purpose of the fractionating column is to increase the cooling surface area and to provide hurdles or obstructions to the ascending vapours and descending liquid . Principle: Suppose we have a mixture of two fluids A and B of which A’ is more volatile than B.When such a liquid mixture is heated, the temperature rises slowly and mixture starts boiling. The vapours formed mainly consist of the more volatile liquid A’ with little of the less volatile liquid B.As these vapours travel up the fractionating column, the vapours of the less volatile liquid B condense more readily than those of the more volatile liquid ‘A’ Therefore, the vapours rising up become richer in A and the liquid flowing down becomes richer in B.
vapours reach the top of the column and escape into the condenser, they consist mainly of the more volatile component A. Similarly, after a series of successive distillations, the remaining liquid in the distillation flask gets enriched in higher boiling component. Each successive condensation and vaporization is called theoretical plate. Commercially, columns with hundreds of theoretical plates are available. This method is used for the purification of high boiling liquids and liquid which decomposes at or below their boiling points. Principle: A liquid boils when its vapour pressure becomes equal to the external pressure. The same liquid would boil at a lower temperature if the pressure acting on it is reduced. Since the liquid now boils at a lower temperature, its decomposition does not occur. With vacuum pumps, pressure of the order of 0.1 mm Hg can be easily obtained. Glycerol which decomposes at its boiling point (563 K) can be distilled without decomposition at 453 K under 12 mm Hg pressure. Concentration of sugarcane in sugar industry. This is a convenient method for the separation and purification of organic compounds from non- volatile organic or inorganic impurities. This method is applicable to only about those compounds which are volatile in steam, insoluble in water, possess a vapour pressure of about 10-15 mm at 373 K and contain non-volatile impurities. Steam distillation is particularly valuable when the substance to be purified boils above 373 K at 760 mm and decomposes at or below its boiling point.Steam distillation makes the high boiling substances to distil at low temperature and hence avoids their decomposition. Principle: In this method, a mixture of two immiscible liquids, i.e., water and an organic liquid is heated. Each would exert its own vapour pressure independently of the other and the mixture will begin to boil at a temperature when the sum of the vapour pressures of the organic liquid (p1) and that of water (p2) becomes equal to the atmospheric pressure (p). Unless the vapour pressure of water or that of the organic liquid is zero, the temperature at which the mixture boils must be lower than the normal boiling point of both the organic liquid and the water. In other words, the organic liquid boils at a temperature lower than its normal b.p and hence the decomposition is avoided. The partial pressures of different gases in a gaseous mixture are in the ratio of their relative number of moles. Therefore, the ratio of the number of moles of the organic liquid and water in the distillate must be in the ratio of their partial vapour pressures (in the boiling mixture), ie. where n1 and n2 are the no. of moles and, p1 and P2 the partial pressures of the organic liquid and water. where M is the molecular mass of the organic liquid. Equation gives the relative masses of the organic liquid and water in the distillate. 1) A mixture of nitrobenzene (bp. 483 K) and water (b.p. 373 K) boils at 372.3 K during steam distillation. At this temperature , the vapour pressure of nitrobenzene is 20 mm and that of water is 760 mm. 2) A mixture of water (b.p. 373 K) and aniline (b.p. 457 K) boils at 371 K at 760 mm pressure in steam distillation. The impure organic compound mixed with water is taken in a round bottomed flask and steam is passed.The mixture starts boiling when the combined vapour pressure becomes equal to the atmospheric pressure. At this temperature, steam mixed with vapours of the compound passes over to the condensed where they are condensed and collected in the receiver. The distillate contains the desired substance and water which can easily be separated with the help of a separating funnel. Some of the compound which can be purified by this process are o-nitrophenol, bromobenzene, aniline, nitrobenzene, essential oils, turpentine oil, etc. This method is used to recover organic compounds (solids or liquids) from their aqueous solutions. The process essentially involves the shaking of the organic compound in a separating funnel with a suitable solvent which is immiscible with water but in which the organic compound is highly soluble. Ether, benzene, chloroform, carbon tetrachloride are some of the solvents which are generally employed for extraction. funnel and the organic layer separated. The aqueous solution is again poured into the funnel, mixed again with a small quantity of the organic solvent and the process is repeated several times till the entire amount of the organic compound is extracted. The organic layers from all the steps are taken in a distillation flask. The organic solvent is distilled off leaving the organic compound in the distillation flask. The efficiency of the process of extraction depends upon the number of times the extraction is repeated. 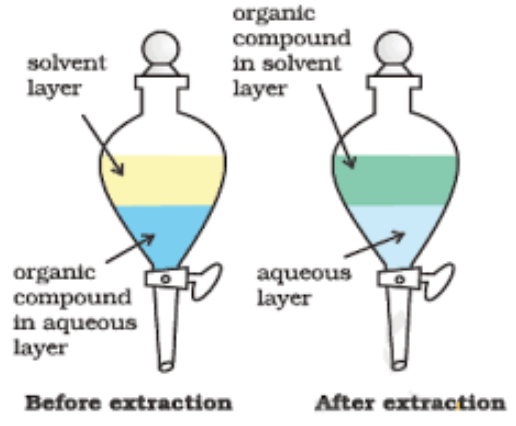 With a given amount of the solvent, larger the number of extractions, greater is the amount of the material extracted. This method is normally applicable to non-volatile compounds. For example, benzoic acid can be extracted from its water solution using benzene. This method is widely used for separation, purification, identification and characterisation of the components of a mixture, whether coloured or colourless. influence of a mobile phase. Paper or partition chromatography Liquid/Liquid Qualitative and quantitative analysis of organic compounds and inorganic compounds. Principle. This method is based upon the differential adsorption of the various components of mixture on a suitable adsorbent such as silica gel or alumina. Since some compounds are more strongly absorbed than the other, they will travel through the column at different rates and thus get separated. (1) Preparation of the Column: A plug of cotton or glass wool is placed at the bottom of a clean and dry glass column. Above this, a thin layer of acid-washed sand is placed to support the adsorbent.A suitable adsorbent such as alumina (Al203), silica gel, magnesium oxide, starch, charcoal, etc is made into slurry with a suitable solvent (preferably non-polar) such as hexane or petroleum ether. The slurry is then carefully packed in the column by gentle tapping so that no air bubble is entrapped in the column. This constitutes the stationary phase. narrow band. A thin layer of acid washed sand is again placed at the top of the column followed by a loose plug of cotton.The sand layer prevents the column from being disturbed during the addition of solvent from time to time. column is allowed to stand for about 15-20 minutes. During this period the various components of the mixture (say A ,B and C) are adsorbed to different extents depending upon their polarity within a narrow band. Thus, within the narrow band, component A is strongly adsorbed component B is moderately adsorbed while component C is weakly adsorbed. A solvent or a mixture of solvents which is used to extract the column constitutes the mobile phase and is usually called an eluent. As the eluent passes down the column, it dissolves the different compounds. The least strongly adsorbed component of the mixture, i.e., component C is eluted first by the least polar solvent followed by moderately strongly adsorbed component B by solvent of intermediate polarity while the most strongly adsorbed component A is eluted last of all by the solvents of higher polarity. For example: a mixture of naphthalene (hydrocarbon) and benzophenone can be separated over à column of alumina and by using petroleum ether containing benzene as eluent. Naphthalene being less polar is weakly adsorbed while benzophenone being more polar is strongly absorbed over the column.Elution of the column will first elute naphthalene and then benzophenone. It is another type of adsorption chromatography in which separation of the components of a mixture is achieved over a thin layer of an adsorbent. A thin layer of an adsorbent such as silica gel or alumina is spread over a plastic or glass plate of suitable size. rom each end. The lower pencil line is called the base line while the upper line is called the finish line or solvent front. (2) A solution of the mixture to be separated is applied as a small spot with the help of a capillary on the starting line. The plate is then placed in a closed jar containing a suitable solvent. (3) As the solvent moves up, the components of the mixture also move up along the plate to different distances depending upon their degree or extent of adsorption. When the solvent front reaches the finish line, the plate is removed and then dried in air. light, this method is not of general applicability. show up as brown spots. ketones can be detected by spraying the plate with the solution of 2, 4-dinitrophehylhydrazine. Since the solvent front always moves faster on the TLC plate than the compounds, Rf , values are usually expressed as a decimal fraction. In paper chromatography, a special quality paper called chromatographic paper is used. Although paper consists mainly of cellulose, the stationary phase in paper chromatography is not the cellulose but the water which is adsorbed or chemically bound to it. The mobile phase is another liquid which is usually a mixture of two or three solvents and water as one of the components. Principle: Paper chromatography works on the principle of partition, i.e., it is based upon differential partitioning (or distribution) of the various components of the mixture between the stationary and the mobile phases. Process: 1) A suitable chromatographic paper is selected and a starting line is drawn across the width of paper at about 1 or 2 cm from the bottom. (2) A spot of the mixture component to be separated is applied on the starting line with the help of a fine capillary or syringe. The chromatographic paper is then suspended in a suitable solvent mixture. the mixture travel through different distances depending upon their solubility in or partitioning between the stationary and the mobile phases. (4) When the solvent reaches the top end of the paper, the paper is taken out and allowed to dry. The paper strip so developed is called the chromatogram. The spots of the separated coloured compounds are visible at different heights from the starting line and are identified by their Rf values. (5) The spots of the colourless compounds may, however, be observed either under ultraviolet light or by the use of an appropriate spray reagent. Uses. Paper chromatography is especially used for separation of sugars and amino acids.